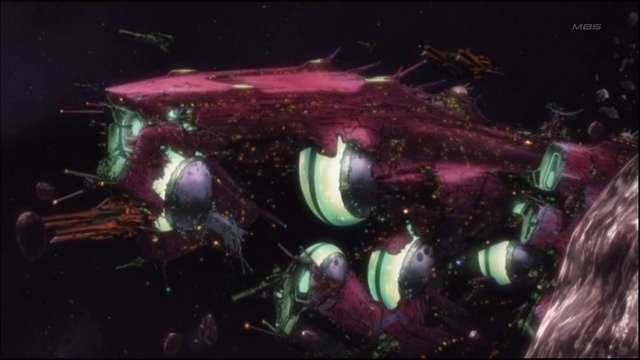 Episode 15 of Macross Frontier, “Lost Peace”, starts off with Grace when the Vajura fleet was awakening and she activated the fold weapon back at Gallia 4. She’s mentally talking with others who are apparently the same kind of entity she is. And apparently the SDF-04 Global was the birthplace of Grace by the way another referred to it, asking her whether it was OK for her to destroy her birthplace. Or was it referring to Gallia 4 itself? Meanwhile, after Gallia 4 is destroyed, we see an apparently secret compartment at Macross Frontier with a new replica of Grace’s body, which is about to receive a download of a new mind and awaken. What kind of entity are Grace and her compatriots? Were they an artificial sentience that was developed in the 117th fleet? Or were they a lifeform from Gallia 4 itself? It also appears that they could be some sort of hivemind, and that they don’t really mind the death of an individual, considering that they refer to the mind downloaded to the new body for Grace as both a separate entity and yet part of all of them. For all we know, they might actually be remnants of the Supervision Army, a group of Protodeviln that came into this universe at Gallia 4. It’s also possible that they might be software entities on an information network formed by connections consisting of fold links. The first half is somewhat of a recap of Macross Frontier, with the mysterious entities discussing among themselves what has happened so far. Sheryl was indeed unknowingly part of some project. Her code name is Fairy 9 in the Carnival Project, although I still have no idea what exactly the project is for, and I’m sure Sheryl doesn’t have any idea that such a project even exists. I’m not sure if she was created or recruited for the project, but I suspect she was artificially created for some purpose, probably related with her singing. Grace certainly doesn’t want anyone else to know what her blood is like, considering the switch she made when the nurse took a sample of Sheryl’s blood in the hospital. It’s revealed that the selection for Sheryl’s final concert in her tour at Macross Frontier was done after 18 months of careful research. The reasons for the selection were that Macross Frontier had a large bioplant infrastructure, forbade cybernetic implants and cyborgs, was heading towards a certain direction near the center of the galaxy, and that a survivor of the 117th fleet, Ranka, was living there. And the mysterious entities seem to be closely connected to the Vajura, either by controlling them or actually being them. They apparently wanted the Macross Frontier fleet destroyed in the operation by using Sheryl to attract the Vajura, although I still don’t know why. The operation unexpectedly failed thanks to the SMS, the VF-25, and Ranka, things they didn’t expect would change the outcome significantly. And Sheryl’s earrings indeed seem to have some special status in that it seems to be intimately connected with fold space somehow. They allowed her and Ranka’s singing to be transmitted to Alto through “fold strings” when the SMS was mounting the rescue operation for the Macross Galaxy fleet. I’m also worried for Sheryl’s safety. Whatever they’re aiming for, they appear to think that Ranka, which they call by the code name Q1, is much more useful for their purposes, so they’re going to dispose of Fairy 9. No action against Sheryl has been taken so far, but she’s still sick, and in fact she may have been sickened on purpose. Grace might also be abandoning her. Grace might not be officially quitting the management for Sheryl, but I get the feeling that for all practical purposes she’s being abandoned. She is in fact impressed that Sheryl managed to survive the destruction of Gallia 4 after being left there to die on purpose. Sheryl herself is definitely worrying about Ranka getting ahead of her, although I’m not sure if she’s worried about being behind in her career or romance. However, she doesn’t have a clue of whatever Grace is planning for her. While we don’t know what Grace’s plans exactly are, we do know that it’s not going to be anything good. 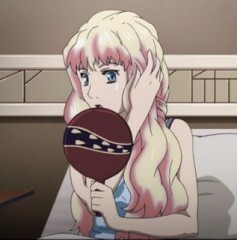 Catherine and Ozma are also suspicious of what’s going on, especially after finding out that Brera’s fighter has been showing up around Macross Frontier even before Alto first saw it. And Catherine is sure that the president, her own father, is unaware of the possible conspiracy after her own investigations into the matter. They do think the most suspicious person involved in the conspiracy would be Leon. At the hospital, Sheryl gets a visit from Alto, and the way she makes sure that she looks good before letting him in definitely shows that she’s romantically interested in him, even though she still tries to act nonchalantly in front of him. However, she feels either disappointment or worry when it turns out that Alto didn’t come alone and came with Ranka. Meanwhile, Ranka is being splayed all over the news, including her impromptu performances at the Zentraedi commercial area and Gallia 4. With Ranka’s street performance being played on the news, Sheryl reveals the “date” she had with Alto at the same time. 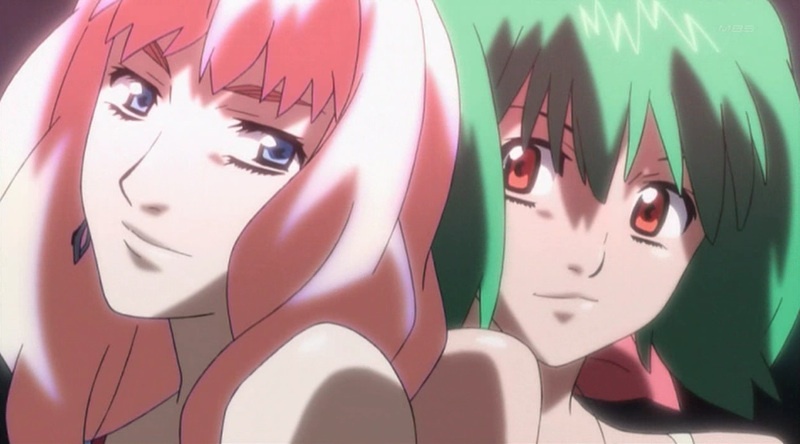 This starts a round of expression of gratitude to each other starting from Ranka, where she thanked Alto for giving her courage to become a singer, then with Sheryl thanking Alto for being with her during her crises, and with Alto thanking both of them for their singing which gave him strength when he was in the Vajura carrier saving Luca. This ends up with Ranka and Sheryl singing what is effectively a duet in an attempt to get Alto’s attention, with Sheryl starting it since Alto seemed to be paying attention to Ranka while the news was playing Ranka’s singing in the background. This feels like the moment that the love triangle is really taking off, even though no words are being spoken, with Sheryl and Ranka vying for Alto’s attention. And they both are remarkably good at singing together, something that the rest of the public at the hospital also notices. Personally, I think even a three-way relationship could work with the way they all like and respect each other, although I’m pretty sure the television series isn’t going to go that way. The duet is halted when Sheryl coughs and nearly collapses. Perhaps she’s taking the “639 Witch Craft” pill again at Grace’s recommendation, and maybe she’ll get better when Michelle convinces her to stop taking it. Ranka and Alto are then summoned to the government and Brilla, respectively. Apparently Brilla and Grace are on opposing sides of something, since Brilla is taking great measures to keep certain things private while Grace is impressed at his caution when she tries to snoop on him. Grace is going to lead the project which will support Ranka in the battle against the Vajura. Ranka is also surprised when it’s revealed that Brera is going to be her bodyguard. On the other hand, Brilla, who is the macronized Zentraedi that owns SMS, has summoned Alto to his private residence, which happens to include a giant railroad set, although presumably we’ll only learn what they’re going to talk about in the next episode. The episode then ends with the ending credits accompanied by the song Diamond Crevasse , except instead of Sheryl singing it, it’s being sung by Ranka. It’s a beautiful song, although I still prefer the version sung by Sheryl. Also at the end of the ending credits we see Macross Galaxy hiding out in an asteroid field intact. They’re still pulling the strings behind the scenes, and I’m not sure if Macross Galaxy is even being controlled by humans anymore. At least something related to humans is in charge, though, considering that Grace calls Brera her “uncle”. That might mean that her kind is really some new kind of lifeform that was born from Ranka or a sister of hers, and the Vajura from Gallia 4 might have been a sort of prototype of them. The discussion the unknown entities have during the ending credits also seem to imply ominous tidings, especially for Alto. And like they said, we’ll probably see the real start of the entire conflict soon enough. Too bad for Macross Frontier, for which the preliminary conflict has already resulted in enough casualties and damage. And this episode is heavy on background, laying the groundwork for what will come. But whatever it is that’s coming, it’s definitely going to be intriguing, and I suspect it will be connected to the entire Macross franchise, with elements of the Protoculture, the Birdman, the Protodevln, and artificial sentience playing a role. 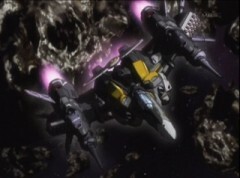 And I have the suspicion that fold space plays an integral role in all this, with the way that fold faults, fold weapons, and fold links are mentioned and the way Sheryl seemed to have an “out of body” experience while in transit when she arrived at Macross Frontier in the director’s cut of the first episode.